If you’ve ever dreamed of putting your feet up while a robotic servant does the vacuuming, now’s your chance. The Roomba robotic vacuum cleaner 776P from iRobot takes care of the cleaning – all you have to do is push ‘clean’ and occasionally empty the bin. The round design of the robot helps it get into awkward areas and rotate comfortably in confined spaces. 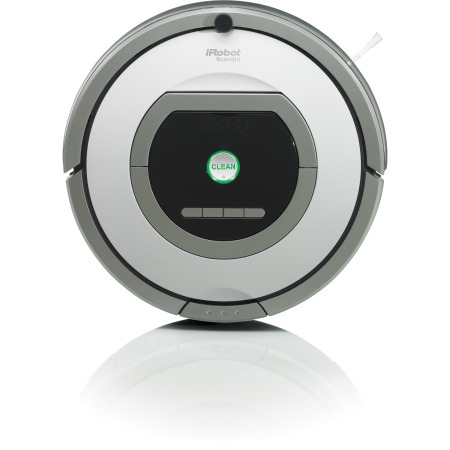 The 776P happily moves forward and backward to clean your floors. It’s also designed to be low enough to fit underneath cupboards and cabinets, even sofas, so these infamous dust traps are kept clean. Counter rotating brushes and powerful suction ensure debris is gathered, leaving floors thoroughly cleaned. A long side brush helps to clean close to skirting board edges. While the 776P may look like it’s cleaning haphazardly, it’s actually following complicated algorithms that ensure the entire surface of the room is vacuumed. This is down to the Responsive Navigation Technology, enabling the Roomba to clean any room thoroughly, no matter its shape. iRobot have designed the Roomba to require minimal human input for it to work. All you have to do is push a button and off it goes. However, if you want the 776P to run while you’re out, you can create a schedule for it to follow. Automatic docking and charging mean you don’t have to keep checking on the 776P or play a one-sided game of hide and seek to try and find it. When the Roomba runs low on charge, it navigates its way back to its charging dock and plugs itself in. Occasionally, you’ll have to empty the bagless bin compartment of all the debris your little robot has gathered, but that’s about it. If you want to avoid vacuuming and enjoy more free time, invest in a Roomba 776P today.